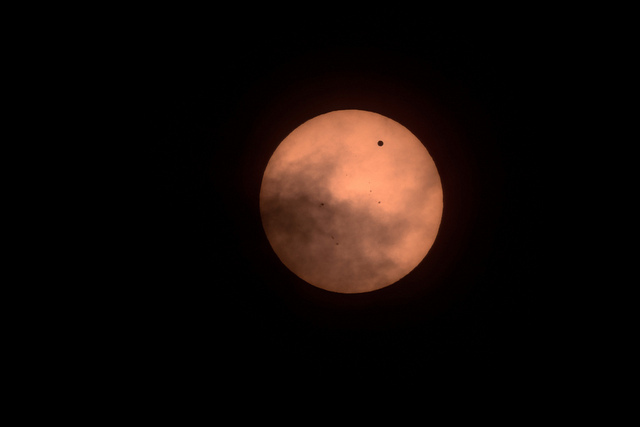 The 2012 transit of Venus. The Transit of Venus came and went this week, not to be seen for another one hundred years or so. But most people partook in viewing parties without knowing the science or history of this planetary spectacle, save that there was a very cool thing in the sky that they should pay attention to. My friends. We seek the solar parallax. That just sounds awesome, doesn&apos;t it? It sounds like a thing Loki would use to subdue the Avengers. It is the perfect name for a thing that appears scribbled on parchment in long dead languages. An object of desire for centuries, which has launched obsessive quests to exotic locales, where adventurers risked life and limb in the single minded pursuit of this elusive and priceless prize. Picture fevered prophets, beautiful native girls, danger on the high seas. Can you picture it? Isn&apos;t it exciting? Good, because to get there, we&apos;re going to have to talk about math. Just for a second. I promise. Say you want to know how far away something is, but you can&apos;t get to it. Perhaps it is quite far away from you, or perhaps you&apos;re just very lazy. A popular method since antiquity is triangulation. To find the distance to point X, you just have to measure the angle to it from two different points (we&apos;ll call them A and B), and then measure the distance between A and B. Now you have a triangle with A and B at the base and X at the top. A couple of quick calculations gives you the distance from the base (where you are) to X.